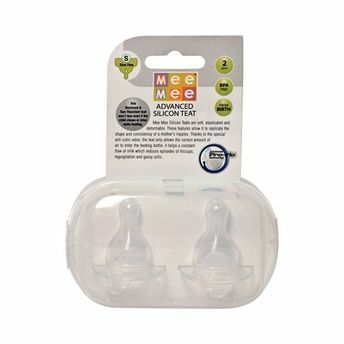 Mee Mee Baby Pro-Flow Technology Silicone Teat Small is carefully made to the highest safety standards. It has a unique anti-colic valve designed to help reduce colic symptoms. Anti-Colic valve permits only the right amount of air to enter the feeding bottle. Explore the entire range of Feeding and Nursing available on Nykaa. Shop more Mee Mee products here.You can browse through the complete world of Mee Mee Feeding and Nursing .Alternatively, you can also find many more products from the Mee Mee Baby Pro-Flow Technology Silicone Teat range.